The principal biological action of ACTH is to stimulate corticosteroid production in adrenal cortical cells. This hormone interacts with receptors in membranes primarily of the zona fasiculata and zona reticularis, although there are also receptors in the zona glomerulosa. A further discussion appears in Chapter 10. 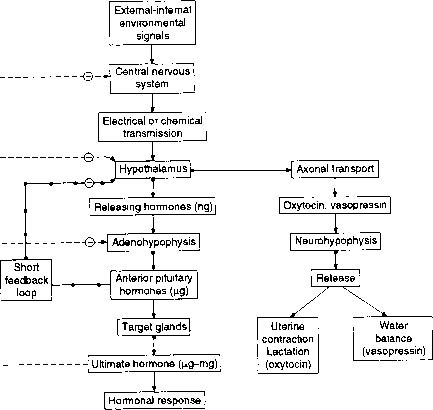 An important aspect of ACTH action, as well as for actions of other anterior pituitary hormones, is that they undergo retrograde transport and redistribution within the CNS, especially the hypothalamus.